Last week authorities apprehended a trader for UBS, the huge, international Swiss bank, on suspicion that he lost $2 billion of the bank's money in unauthorized trades. It's not the first time something on this scale has happened. In 2008 a trader at Société Générale, the giant French bank now so much in the news, lost $6.7 billion of that bank's money in supposedly unauthorized trades before he was caught. My question is quite simple. If these traders had made billions for their institutions instead of losing them, would they have been labeled "rogue" and handed over to the authorities? I ask this question because it seems to me that what is being punished is not excessive risk-taking, but rather excessive risk-taking that loses money. Almost nobody labels risk-taking "excessive" if it results in a win. Then it is called "brilliant" or "gutsy" or "a stroke of genius." And, people who take such risks get large bonuses and are promoted. In 2008 when nearly everything went sour for traders in the world's largest banks, the losses were explained (by the banks and their strategists) as the product of an unbelievably rare confluence of events. When one trader loses a large amount of money, he or she can be labeled "rogue" or, at least, suffer a quick dismissal. But when nearly all traders at a bank have their heads handed to them at the same time, it's not called excessive risk-taking, but rather a fluke. What is not apparent in all of this is that banks and their risk analysts refuse to acknowledge that they face hidden risks which they cannot quantify because they cannot know about them. Risk models are one thing; the real world another. To my mind that makes all but the most conservative bankers "rogue" traders. The current maelstrom in the financial world, however, is not a discrete event. Our attitude in general about risk, especially low-probability, hidden risk, is similar to that of the man who sleeps on the railroad tracks but does not know about the existence of trains. Much of the time he can sleep there undisturbed. But he need only be wrong once in his timing to suffer catastrophe. We have become a society reliant on expert forecasts. In the field of energy, many forecasters make fancy livings pretending to know the future supply and price of various energy sources, especially fossil fuels, projecting sometimes decades into the future. Not wanting to rely on outsiders, governments routinely hire their own experts to make energy forecasts for them. And, policymakers and managers everywhere in society make fateful decisions based on those forecasts without knowing how uncertain they are. Given how central energy is to the functioning of society, nearly all of us have become in some ways like rogue traders, basing our lives and plans on comforting models that contain hidden risks and may have little resemblance to the future we will live in. In that sense, UBS's rogue trader and, in fact, the entire world of financial traders, may be a mirror for society in general, one that we would do well to examine. We might see that energy and so many other systems rely on forecasts with hidden risks for which we have built in little or no margin of safety. Unfortunately, there will be no central bank of energy or any other essential resource to bail us out as those risks make themselves evident. The following is an attempt to weave together many strands of thought from my writings on energy into a compact briefing for energy policymakers. Because of its scope, this briefing is quite a bit longer than my regular weekly pieces. If you are an energy policymaker (or layperson interested in energy) and you are NOT perplexed by the last decade, read no further. You have little to gain from what I write below. However, if you are a perplexed energy policymaker (or perplexed layperson interested in energy), please continue and learn why poor quality data, lack of transparency, broad uncertainty and flawed thinking about risk have made it difficult for many experts and the public alike to think sensibly about our energy future. Fossil fuel resources are so vast that we need not concern ourselves that their supply will start to decline anytime soon. Technology will always allow us to extract these increasingly difficult-to-get fossil fuel resources in the quantities we need at the time that we need them at prices we like. Prices, it is believed, will govern this process in a completely benign way, that is, high and volatile fossil fuel prices won't destabilize the complex systems of modern society in a way that might impair them in the long term. Substitutes for fossil fuels will be introduced gradually in accordance with market signals and will grow commensurate with our need for them. A smooth transition away from fossil fuels will succeed incrementally over many decades. The data on fossil fuel supplies is either sufficiently robust to reassure us of benign outcomes or the data do not matter since reserves of fossil fuels and the substitutes for them will expand in accordance with market signals thereby vindicating optimistic forecasts for future energy supplies. Whether such assumptions form the basis for sound energy policy is the subject of this piece. The first thing a perplexed energy policymaker must grapple with is the fact that 86 percent of the energy used by human societies currently comes from fossil fuels. This overwhelming dependence on finite supplies of stored fossil carbon in liquid, gaseous and solid form suggests vulnerability all by itself. But perhaps more worrying is the lack of transparency concerning known underground inventories of these fuels. For petroleum many analysts rely on the BP Statistical Review of World Energy which also includes information on natural gas, coal, nuclear energy, hydroelectricity and other renewable energy. The data provided in the review is simply that reported by various governments or from published sources. The reliability of that data, however, cannot be assured. One example that raises suspicion is the curious jump in reported reserves among OPEC countries in the mid-1980s. At the time OPEC changed its rules to take into account the size of reserves in assigning a production quota for each country. The bigger the reserves, the larger the production quota. So, this curious jump can be explained by the equivalent of grade inflation in the oilfields of OPEC. Skeptical observers have dubbed these phantom additions "political reserves" and usually subtracted all or some from official tallies of world totals. Further adding to skepticism about the reported numbers are long, unchanging series which indicate that some reported reserve numbers almost surely do not reflect changes on the ground in exploration and depletion. The United Arab Emirates has reported oil reserves of 97.8 billion barrels for the past 15 years. Kuwait reported 96.5 billion barrels in reserves from 1991 to 2002. 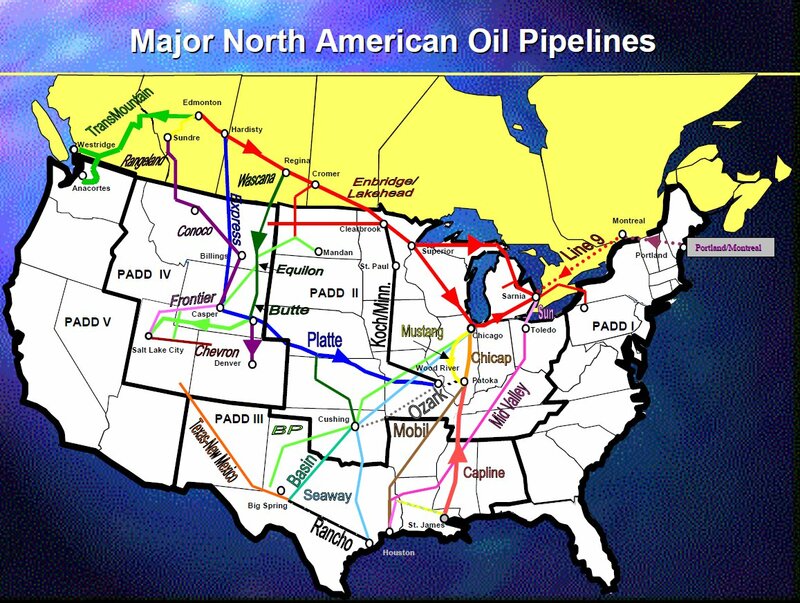 From 2004 through 2010, it reported 101.5 billion barrels every year. Saudi Arabia reported reserves within a narrow range of 260.1 to 264.5 billion barrels from 1989 through 2010. At least those numbers shifted slightly each year. The competition within OPEC continues to this day as Iran attempts to eclipse Iraq's newly updated reserve estimate. Are we seeing new "political reserves" or something based on actual exploration? Certainly, many analysts will offer explanations for these reserve numbers. But there is no way to tell for sure whether their explanations make sense since OPEC nations and many other countries do not submit to independent audits of petroleum reserves. So far, energy planners have simply had to take the word of most petroleum producing countries about their oil reserves. We are clarifying that the required disclosure would be limited to a concise summary of the technology or technologies used to create the estimate. A company would not be required to disclose proprietary technologies, or a proprietary mix of technologies, at a level of specificity that would cause competitive harm. Rather, the disclosure may be more general. The methods for grinding out reserve estimates can now remain secret. To outsiders reserve estimates will in many cases be coming from something which looks more and more like a black box. Many of the same issues also apply to natural gas estimates since oil and gas are obtained using similar methods by the same industry. One reason for caution is the highly optimistic claims being made for natural gas supplies from shale deposits. The U.S. Energy Information Administration (EIA) has already decided that its methods may have overestimated U.S. production from shale gas wells by 10 percent in 2009, erasing much of the supposed 11 percent jump in domestic natural gas production. 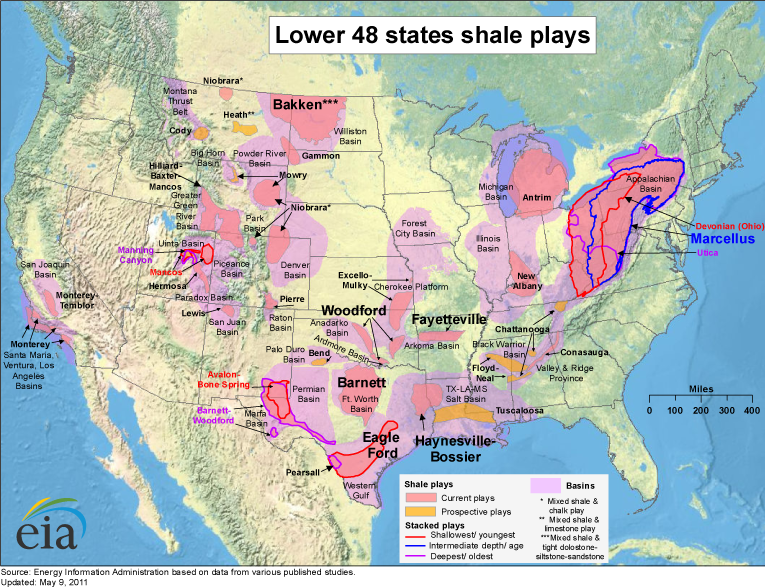 As for reserves, there are many reasons to be skeptical about the reported reserves of shale gas including the failure to specify a price (since prices clearly influence what is economical to get out of the ground) and the booking of very low-return or just breakeven discoveries as a way to inflate reserves and promote a publicly traded company as an asset play. 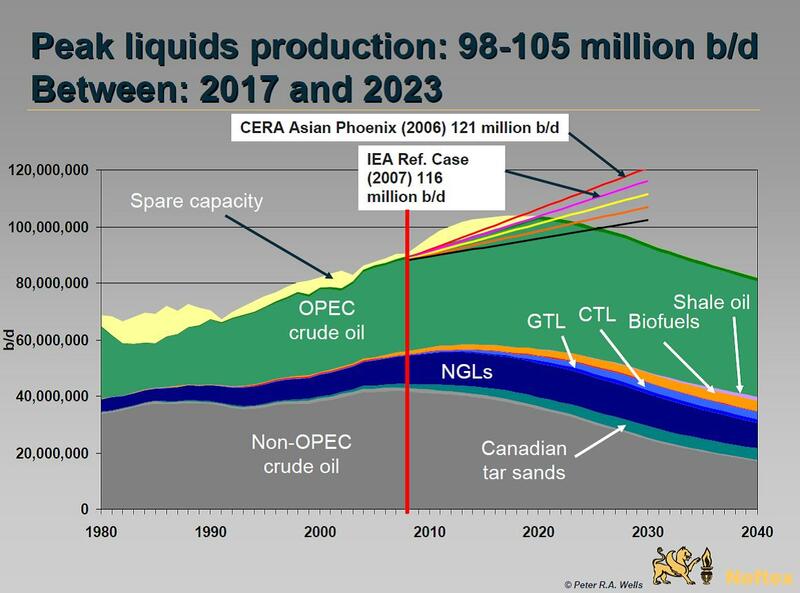 That the picture remains opaque should be cause for concern given the extravagant claims made for shale gas including its ability to displace oil and coal in the near to medium term. The data for coal reserves are even more problematic since governments don't routinely do comprehensive surveys of coal deposits. The Energy Watch Group's paper entitled "Coal: Resources and Future Production" claims that Vietnam has not updated its stated coal reserves for 40 years. China has not done so since 1992 despite the fact that 20 percent of the country's reserves have presumably been produced since then. 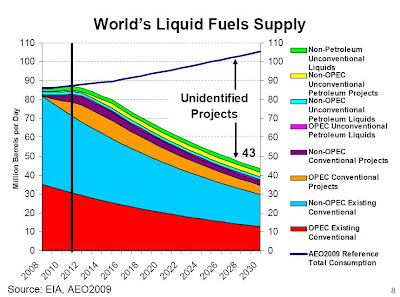 Even the venerable BP Statistical Review of World Energy has no historical data on reserves. 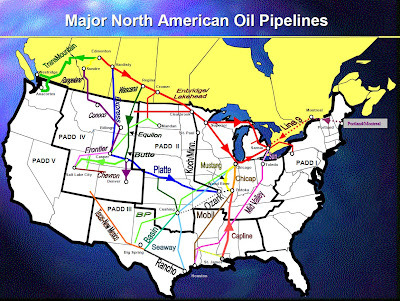 And, the U.S. Energy Information Administration has reserve data starting only in 2008. Present estimates of coal reserves are based upon methods that have not been reviewed or revised since their inception in 1974, and many of the input data were compiled in the early 1970s. Recent programs to assess reserves in limited areas using updated methods indicate that only a small fraction of previously estimated reserves are economically recoverable. Such findings emphasize the need for a reinvigorated coal reserve assessment program using modern methods and technologies to provide a sound basis for informed decision making. The report suggested that supplies might amount to 100 years at current rates of consumption and urged a thorough survey. Of course, the 100-year figure does not take into account any increase in the rate of production over that period or any decline in production once the peak in the rate of production has passed. The picture for uranium is just as opaque and confused as it is for fossil fuels. How could it be otherwise for a fuel source that is mined in disparate places, many of which are not known for their transparency? Uranium is, of course, also subject to greater levels of secrecy because of its military applications. The Energy Watch Group believes known reserves--given expected rates of use including amounts needed for new nuclear plants--are likely to last only 30 years. Higher price assumptions could bring that number to 70 years. But in truth nobody knows. Uranium availability remains acutely sensitive to price assumptions and resource estimates. Perhaps the single most important caveat any of these reports provides comes from both the Energy Watch Group and the National Academy of Sciences report. They said that policymakers need to focus on reserves, not estimated resources. Reserves, of course, are resources that can be extracted profitably at current prices with current technology from known fields. Resources, by contrast, include all amounts of fossil and nuclear fuels believed to be in the Earth's crust. But that classification says nothing about whether those resources are economical to extract or even accessible. And, it says even less about the rate of production which, after all, is the crucial metric for our complex society because it is dependent on continuous inputs of high-quality (and to date rising) energy for its stability and functioning. It should be no surprise that given the poor quality of energy data and the lack of transparency among many producers, there is broad uncertainty about fossil fuel supplies in the long term. The data is more transparent for renewables such as wind and solar since these involve manufactured devices with aboveground installation and are thus more quantifiable. The result of all this opacity in the data, especially for fossil fuels, is a set of widely diverging forecasts for future energy supplies. The people providing these diverging forecasts don't necessarily disagree on the data. Rather, they disagree on how to interpret data that is unverified or simply speculative (such as data on so-called "undiscovered" resources). Every forecast is a way to express views about risk; but that is something I will discuss below. First, let's look at a graph created by Glen Sweetnam, an analyst from the EIA. But even the optimists have lowered their expectations as reality has started to make their projections seem less plausible. 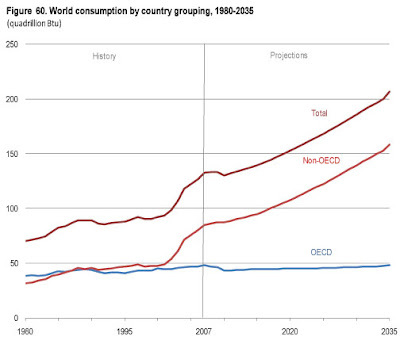 As recently as 2005 the EIA was projecting that oil consumption would reach 119 million barrels per day by 2025. 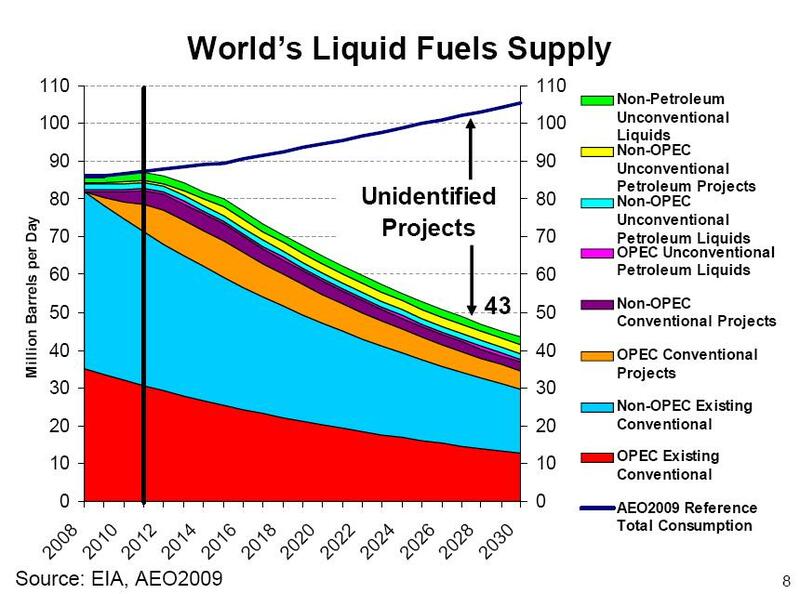 A forecast prepared in 2010 projects consumption to be 97.6 million barrels per day by 2025. The issue that should concern us is that all three graphs are produced by professionals looking at essentially the same data. To find an explanation, we need to examine assumptions. It should be clear by now that Wells has little faith that new (yet-to-be invented?) technology will be able to offset the depletion of conventional oil resources. Detractors of Wells and his brethren are fond of using the straw man that pessimists claim we are "running out of oil." But, of course, Wells' point is that peak means only that a decline in the rate of production is about to begin. 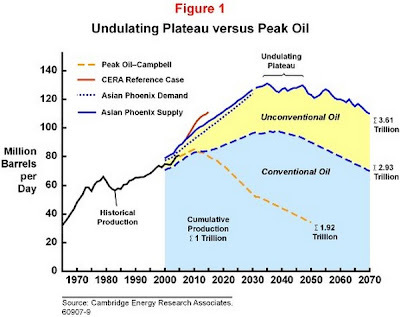 Jean Laherrère, the French petroleum engineer who with Colin Campbell co-authored the seminal 1998 Scientific American piece, "The End of Cheap Oil", manages to put into one graph two wildly different scenarios for future natural gas production. What these graphic representations leave aside entirely is the question of net energy. 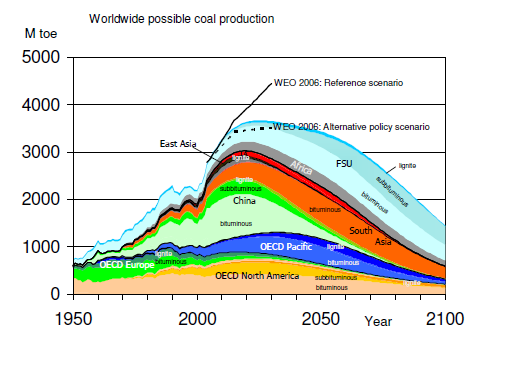 The assumption embedded in the optimists' projections is that net energy from carbon-based sources will hold steady or rise. This is despite the fact that energy return on investment or EROI has been declining for oil and natural gas for decades. Society runs not on gross energy, but net energy, that is, the energy left over after we find, extract, refine and deliver energy to its final destination. As society seeks out the more difficult-to-get hydrocarbons, there will be a continuing race between technology and geology. In recent decades, it appears that geology has been winning the race as EROI has fallen despite many technological advances in extracting hydrocarbons. Furthermore, it is logical that net energy from hydrocarbons will peak before gross energy, and this suggests that we need a new way to evaluate our remaining energy resources that accounts for falling EROI. Though some of the graphs above suggest continued exponential growth in the production and consumption of hydrocarbons, many analyses use "years at current rates of consumption" as a yardstick for the amount of remaining resources for any hydrocarbon. A simple illustration will show how deceptive this can be. The picture gets acutely worse as the rate of production growth rises. A 3 percent rate implies exhaustion in 47 years and peak in 31 years. A 5 percent growth rate means exhaustion in 37 years and a peak in just 26 years. Claims that any finite resource will last X number of years at current rates of consumption when consumption of that resource is growing exponentially are wildly misleading. Even more misleading is providing forecasts of abundant natural gas without specifying a price. Without a price, such forecasts are virtually meaningless. It is a truism that higher prices allow more of any resource to be extracted profitably than do lower prices. Will the supposed bounty of natural gas be available at the low prices of today? Drillers tap the gas that is easy to get first. Only later do they move on to those deposits which require more money and energy to extract. It's a logical strategy, and one that casts doubt on the idea that natural gas can be both plentiful and cheap in the long run. Another source of uncertainty is that much of the data on energy perforce must come from industry. Even when companies do not intend to deceive, such data is likely to suffer from an optimistic bias designed to pump up stock prices, impress possible acquirers, or increase a country's share of any OPEC production quota. And, we must remember it is the responsibility of every fossil fuel company to maximize its shareholders' value by making sure it can sell all of its underground inventory. By making inventories seem large, fossil fuel producers encourage complacency among policymakers and the public. A final source of uncertainty is what is called the rate-of-conversion problem. The phrase refers to the time that it takes to convert from one energy infrastructure to another versus the time a society has before energy from existing fuel sources starts to decline. Optimists don't like to discuss the amount of time it might take to find substitutes for fossil fuels, particularly petroleum, and the time it takes to deploy the infrastructure to deliver them. But finding substitutes for petroleum has turned out to be more difficult than anticipated. Even though petroleum prices have been rising for more than a decade; even though there are plenty of non-economic reasons to move to alternatives including volatile prices, air pollution, greenhouse gas emissions, possible supply disruptions and vulnerability related to the military's reliance on petroleum fuels; and even though there have been decades of research and development on alternative liquid fuels, today 95 percent of all transportation fuel continues to be derived from petroleum. Energy transitions take generations, not years. And, there is no guarantee of success. Vaclav Smil, who has written extensively about energy and energy transitions, believes that it would be prudent for high-energy consuming nations to create specific targets for reducing overall energy use. Given the constraints he sees, this is one of the best ways to increase the odds of a successful transition. Given the poor quality data available to energy policymakers and given the broad uncertainties this engenders, how should policymakers assess risk? I believe policymakers need to ask two questions: 1) What would society look like if the optimists are right versus if the pessimists are right? 2) With which forecast is current policy aligned? The answer to question one is that human societies will proceed with business-as-usual if the optimists are right. If the pessimists are correct, then world society will be in for a wrenching adjustment that could destabilize the economy, undermine critical areas such as agriculture and transportation, and possibly lead to civil unrest and political chaos. In the pessimists' scenarios, peak production matters because it comes before we will have deployed adequate substitutes and, in all likelihood, before we will have an orderly plan for reducing energy use. This then tells us the answer to question two. Energy policy in most countries is currently aligned with the optimistic forecast. The assumption for most government and corporate planners is simply the extrapolation of recent trends. The previous discussion illustrates just how asymmetrical the risks we face are. One outcome is decidedly more dangerous for society than the other. It's not as if we are walking into a restaurant seeking a cold beer and finding none available, settling for ginger ale. Fossil fuels are too critical to society's functioning. And, we cannot simply order a substitute on the spot, at least not in sufficient quantities to power all that we need to power. What this tells us is that the optimistic scenarios must turn out to be largely correct if human societies are going to avoid debilitating shocks (assuming no preparations for more pessimistic scenarios). And, this points up a deficiency in all the graphs sited above. The accuracy of forecasts deteriorates rapidly with time. In fact, two and three decades hence, it is the error bar or range which matters more than the forecast. And yet, none of the forecasts cited even provide an error bar--a serious omission that tends to mislead policymakers and deceive the public about the accuracy of long-range forecasts. In essence, I have provided my own error bars in this analysis by looking at both the optimistic and pessimistic forecasts. What that analysis suggests is that it would behoove policymakers at the very least to pursue a hedged strategy that involves serious reductions in total energy use, greater funding of research into alternatives, and incentives for rapid deployment of well-vetted alternative energy solutions. Neoclassical economists (which is almost all economists) will protest that the marketplace will do a much better job of forcing society to make the necessary changes without interference from government. Even if peaks in production are near for oil and perhaps for coal, they believe demand destruction and substitution will allow for an orderly transition. But that's only if their theories about how resource pricing evolves over time are correct. Douglas Reynolds proposes an alternate theory which, given recent history, seems to fit more closely with the facts. He suggests that actual experience tells us that market prices for critical resources have given us the illusion of decreasing scarcity as resource prices relentlessly fell in real terms (except for the 1970s) for a century. Only as we got quite near the apparent limits of exploitation of fossil fuels have prices skyrocketed. In other words, this is no orderly gradual process mediated by market forces. The energy transition which is already underway and for which we are ill-prepared is likely to continue to be a rocky one, marked by booms and debilitating busts that are already challenging the resilience of major social, political and economic institutions. 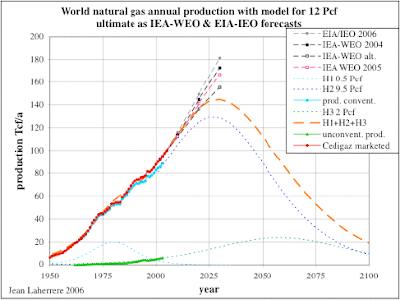 Right now world society is dangerously exposed to possibly faulty forecasts of energy abundance. Given the harsh consequences that could result from accepting such forecasts if we fail to make any preparations for a contrary outcome, prudence would suggest policies that err on the side of caution. The aim in energy policy should be ultimately to make world society forecast-proof when it comes to energy. This is not to say that forecasts won't continue to be made or that it is wrong to make them. But the hope would be to fashion an energy infrastructure for which forecasts are largely irrelevant. How might that be done? A society whose energy needs have been greatly reduced by radical efficiency and changes in methods and behaviors could be largely powered by renewable energy. That the sun will shine, the winds blow and the waters flow for a very, very long time is not so much a forecast as a scientific fact. That's the kind of change that could render the energy forecasting business largely irrelevant and allow society to redirect its efforts to more useful pursuits.